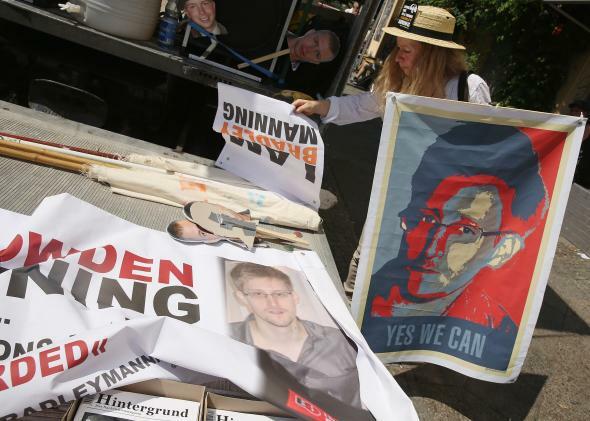 Edward Snowden is Moneybox's person of the year. As you know, ever since 1927 Slate’s Moneybox column has annually designated a “Man of The Year,” with the title changed in 1999 to “Person” of the year but in practice it’s almost always a man because patriarchy. It’s an honor bestowed not necessarily on the best person of the year, but on the most influential figure. The one who’s touched the largest number of people in the most profound way. At times that goes to a person of mixed reputation like 1931 winner Wallis Simpson, who upended the British monarchy. At times we’ve even been accused of “trolling” or “Slatepitches,” as when we picked Adolf Hitler in 1938 and Ayatollah Khomeini in 1979. So when I tell you that Edward Snowden is 2013’s Person of the Year, don’t necessarily take that as an endorsement of all his views and everything he’s done. But there’s no doubt that his actions have had broad significance, upending German politics and technology companies’ business strategies. Snowden’s revelations and his controversial flight to Russia bring together the defining trends of our era—social media and the continued legacy of the Sept. 11 terrorist attacks. Our committee did seriously consider other contenders, including the new Pope. But since Catholics everywhere have decided to act pissy about non-Catholics who are excited about the new Pope, insisting that all Popes have always said this stuff and it’s all just a huge misunderstanding to think there’s anything novel about him, we decided to snub the guy. The snub will probably provoke whining of its own, but that’s what you get. Also, homilies are nice, but Snowden has impacted the course of history in concrete, tangible ways. If someone from inside the Church wants to leak the real dirt on the Vatican Bank next year, we’ll consider giving that guy the prize. For Slate’s complete Snowden coverage, use Google like a sensible person. Update: No! Wait! We have have a really good search function now!